Let's Talk Alias: YIPEE DVD! YAHOO! 1 Day and the season 5 DVD's will appear in my mailbox! YESSSSS! 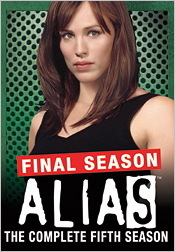 I saw tons of Alias DVD commercials on TV last night- tons and they gave me goosebumps! I'm syked! Are you? I am oober excited for the behind-the-scenes, the bloopers and of course the "emotional cast reunion." Be ready ladies and agents, this blog will be back in full swing by next week! PS. Mom and Dad, if you are reading this- I would love either the Rambaldi Box set or seasons 1 and 2 for Christmas. Wink! woohoo, can't wait!! Though mine prob won't come until the first week of Dec. (at least that's what Amazon told me). I'm excited! YES! i get mine tonight because my brother works at walmart and he's gonna get it right when they get it. whoo!! If anyone needs Season 1 or 4, I don't need them anymore (bought them used on Amazon marketplace a couple days before the Rimbaldi box was announced for really cheap - $35 and $22 respectively). I never even watched them because I wanted to start from the first episode and bonus features on the box set and watch all the way through again after anticipating it for a few months. Mine is coming from Amazon in the 5 season box set. Don't know if I'm going to be able to wait. I'm dieing to see the extra info they included on Rambaldi in that set. I CAN'T BELIVE IT!! I just now got an email from them saying it just shipped and should be here Saturday!!! Now I really can't wait!! No Kellie, you are totally welcome to advertise here, we are all about sharing and exchanging and enjoying Alias! so are there MORE special features w/ the Rambaldi DVD box set than with the individual seasons?? I'm thinking the Rambaldi box must go on my christmas list as well! I got my email from Amazon yesterday saying my season 5 had shipped! :) Whoo-hoo!!!!! I'm hoping it gets here before Thursday so I can spend the holiday all camped in watching season 5!! Box set shipped out and I hope to get it on Friday. Whoo! srg-alias: I think the Rambaldi box set will have the same features of the individual seasons plus a few more. No commentary by JJ and Jen for the finale. Oooh, I can't wait! WalMart sent me an e-mail saying it shipped on Sunday...is it too much to hope it will arrive TODAY??? I am leaving town tomorrow and I REALLY want the DVDs to come today...I got the box set...little prezy to myself. I have been rewatching Season 1...love it! I think the boxed set is supposed to have more in it than the individual seasons do. But, I hope to know for sure on Sat and I'll let you know. I JUST GOT MINE!!!!!!!!!!!!!! Jealous? I got my Rimbaldi box too and I am fighting not to open it. It is supposed to be my Xmas present. Maybe I'll do what I did when I was 10 years old and carefully unwrap it, watch it while my husband is at work, and then re-wrap it each evening before he gets home. My 3 year olds love to dance to the Alias music. I could do it for them! They would undoubtedly betray me and reveal my secret though. Hmmmm - the dilema. OK guys, tell us about the Rambaldi extras!! you all that got the limited edition should look at the website that dlove posted about the review. It mentions the Easter Eggs that comtain other interviews and behing the scene footage. When you are on the site, go to his LImited Edition sectin and he tells you when to hit certain buttons on your remote to access those hidden partgs of the DVD. Gotta go back and find the Easter Eggs, but I did end up opening my DVD box and it is well worth the $$. They don't answer all the questions, but they do provide a framework for some of the questions we have had. Uncle 111 I don't think your book is in much danger of being negated. You may or may not have to tweak it, but there isn't too much in the way of Rambaldi answers. They point out some cool things, one of which is that they did read the boards and try and respond to some FAQ's and were perplexed by things people posted about and things people missed. Thanks for the info! I've been a little worried I might have to scrap my whole Rambaldi storyline because of the Rambaldi info in the new set. I'm at the stage where tweaking is not a problem, but I do want to move on with it. I have some wonderfully (if I do say so myself) Alias twists worked out. I have so many things I want to work into this project that I think I'm going to end up with at least a whole season's worth crammed into one book. My set just arrived. I'm taking a break from work to watch the Rambaldi disc. Just watched the segment about Rambaldi. It will take a little tweaking, but not much. I had something really intrigueing I was going to add to Rambaldi's history that I may have to shift to another character, but there may yet be a way to save it for Rambaldi. After reading the booklet it does indeed appear that much of the Rambaldi story line was just a device to move the show along and was not thought out ahead of time. Uncle - the booklet was cool, but lacking in deep content. I agree that it seems as though the writers were not focused on creating a rich Rambaldi thread within the bigger story. It was more of a framework to support the character development and overall direction of the show, which were both rich. I can't wait to read your book to see the answers and fill in all those blanks we all crave so much! I am putting away my set now until Xmas : ) Can't wait to watch it all the way through! It should be the topic at the top titled Alias- Aftermath. There's no way I could save the set till Christmas:)! !